Using 80% soft oils with stearic acid for hardness and myristic acid for hardness and lather. Soaping is just so much fun! -- Learn how to use your biodiesel byproducts to make great bar and liquid soap!!! "So much to learn and that's no lye!" Nice soap. How do you get that nice shine to your soaps. Mine always look a little dull? Using the stearic acid and myristic acid to help harden my soap has an added benefit -- it also leaves a sheen in the soap. When the soap is colored it looks good too. Those do look great, Rick. I like the sheen, too. How much stearic acid did you use ppo? I really like the pink! Believe it or not I used red crayons! Yes, the pink was strictly an experiment for the family. 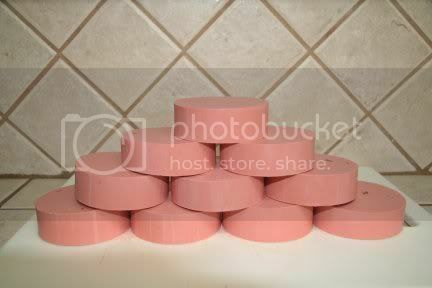 Any soap that I sell lists all the ingredients and I do use soap colorants. Just wondering. . . how much stearic acid do you use ppo? I bought some yesterday so I could try it too! I get canola and soy oil free so I am using that as the bulk of my recipe Nearly 80%. I do not use any hard oils but I add 20% fatty acids. 12% steric and 8% myrisitc. The myristic acid is added to add some lather to the soap. I find this gives me really nice bars that have a great sheen to them. I have used coconut oil and palm kernel oil with my canola and soy oils and that works almost as well but less sheen. 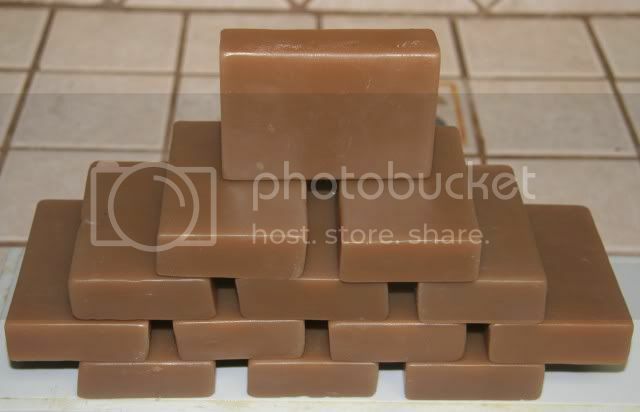 Be aware that with a regular soap recipe if you add to much stearic acid, it can make your soap seize. Yes that can happen -- I hot process my soap and use extra glycerin that helps that from occurring. However any time you use fatty acids instead of a whole oils the saponification process is greatly accelerated. I find that the extra solvent in the form of glycerin keeps the soap in a nice pourable form. I sometimes use sodium lactate, this also helps the pour ability when hot processing. However in this example the sodium lactate was not used. This was a fully pourable hot processed batch due to the extra glycerin solvent.